Iguazu National Park is a protected area of Argentina created in 1934 with the aim of conserving the environment and biodiversity of the Iguazu Falls, which were elected as one of the "Seven Natural Wonders of the World." It is located entirely in the Iguazú Department, along the Iguazu River in the far north of the province of Misiones; has an area of ​​67 620 ha, bordering the city of Puerto Iguazu; its eastern boundary is 17 km from the city of Andresito. It is crossed by 2 national routes: the 12 and the 101. On the Brazilian side is the Iguaçu National Park, forming together with the Argentine National Park a protected area of 2,500 km ² over to the other reserves adjoining Peninsula Harbour added. The Altoparanaense region, which lies in the Iguazu National Park, shows signs of man's room by going back over 10 000 years. It is estimated that around 1000 AD the Guarani, from the north, stormed the region and displaced the native language Ye living there at the time. At the time of the arrival of the Spaniards to the place in the sixteenth century, the Guarani were expanding their territory. These natives were characterized among other things by its various cultures. Alvar Nunez Cabeza de Vaca was the first European to reach the falls, in 1542, baptizing as "Saltos de Santa María." By 1609, settled in the region early Jesuit missions Guarani, which remained in place for over 150 years. 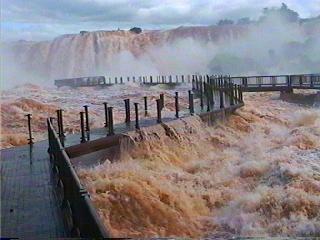 The main mission of reductions or cities was "Santa Maria del Iguazu" of Spanish sovereignty. Its location is almost the same as that of the current Brazilian city of Foz do Iguaçu. In the late nineteenth century the first tourist expedition reached the place. Among its members Victoria Aguirre, who donated the funds with which was begun access ranging from Puerto Iguazu (called the early twentieth century "Puerto Aguirre") to the falls is counted. In 1902, the Ministry of Interior of Argentina Carlos Thays commissioned a detailed survey of the falls, which was taken as a basis for later legislation creating the national park. Iguazu Falls are formed by 275 falls to 80 m height which 80% are on the Argentine side, fed by the flow of the Iguazu River. You can take boat rides under the waterfalls and hiking appreciating some animals semitropical jungle trails. An also the highest show apart is its jump higher flow and 80 m,: Devil's Throat, which can be enjoyed in all its majesty from only 50 m, walking the catwalks that leave from Puerto Canoas, which is reached using the ecological service station. For this jump passes the border between the two countries. The November 11, 2011 Iguazu Falls were elected as one of the "Seven Natural Wonders of the World" 3 The contest began in mid-2007, the foundation of Swiss origin New7Wonder, he attended a billion votos.4 The notice shall be warned that they were provisional; finally, on February 22, 2012, confirmed that foundation cataracts became officially considered one of the 'Seven Natural Wonders of the World. " The falls are located on the Iguazu River, which has a total length of 1230 km to its confluence with the Paraná River. This confluence is located 23 km downstream from the falls. Although the river has a width that is typically between 500 m and 1000 m along its entire length, in the National Park area widens, reaching 1500 m.
Both on the banks of the river and numerous islands of the delta formed, several species of trees that are known for their moisture requirement: curupay, white laurel, cedar mbarayú or Parana, aguay, and kapok (the flower is the national flower of Argentina) are some of them. Overall, the tree flora of the Iguazu National Park is composed of more than 90 species, with characteristics of the place of palm communities and rosewood or peroba. The latter is a tree that can reach up to 40 m high, and whose shadow grow palm, palm trees whose trunks terminate in an edible bud. A variety of some plants that live in a wetland ecosystem. Different types of climates are also found. The main species of birds that inhabit the place, should be cited swifts waterfall, flying through the interstices of the water column to perch on the cliff, where they usually nest. In the area of ​​the runways is not unusual and exemplary coatis big toucan, one of the 5 species of toucans that live in the park. The harpy eagle is also highlighted. In the sunny parts of the trails, especially around noon, you can see examples of lizards, climbing logs and stones. Among the endangered species that protects the park, should be cited the jaguar, tapir, ocelot, jaguarundi, bear big anthill, the tamandua, jungle eagles, and the broad-snouted caiman.